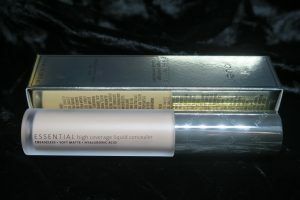 Jouer Cosmetics Essential High Coverage Liquid Concealer* is a new full coverage liquid/ doe foot applicator concealer containing Hyaluronic Acid and Resveratrol and promising healthier looking skin as well as full coverage! Sounds good right?? Already being talked about so much on YouTube and social channels…is it really worth the hype? Let’s find out! ✖️ available in 25 shades…fair to deep and varied undertones. ✖️ has full coverage and a soft matte finish. ✖️ contains Hyaluronic Acid and Resveratrol to take care of your skin’s health and minimise creasing whilst correcting and smoothing imperfections. ✖️ Paraben free, Gluten free and oil free. ✖️ Cruelty free and Vegan. Starting with the packaging which is what our eyeballs reach first and considering you’re only getting 4.41ml of product, both the metallic gold box outer packaging it comes in and the tube itself is pretty big considering! The tube is a frosted plastic with a gold Jouer logo embossed lid…lightweight so pretty good for travel and it does feel well put together and secure as well as looking sleek. The Jouer concealer is a bit less spendy than many of our favourite similar concealers from other brands, but it’s definitely worth comparing size against price with your usual formula! Enough about the size and price though anyway, I guess the main thing is does it deliver on it’s claims?? The shade range (25 shades) is good and pretty standard for higher end concealers at this stage in the game. I feel the tone range is ok, but there’s room for improvement (as there is with most things, so not necessarily a bad thing)…it could maybe just do with adding a few more true neutral tones in there. There’s also quite a jump between the very lightest shade (Snow) and the next darkest (Lace) and between the darkest shade (Ebony) and the next lightest (Hazlewood)…although with the introduction of a few more true neutrals, I feel that would work well towards fixing that too! On a day to day basis (or pretty much ever to be honest), I don’t go for a super highlighted look under my eyes…I might sometimes go a tad bit lighter to add a little brightness, but usually find something of a closer match to my skin way more flattering and much better for correcting under eye shadows as well as giving coverage. I went for the shade Crème in this which is the 3rd darkest shade (even though I’m pretty fair…for reference, I’d usually be the shade Swan in the Too Faced concealer) and described as ‘fair with peachy pink undertones’. Although I have a more golden to neutral skin tone, I don’t mind something a bit more peachy under my eyes as I can get pretty dark naturally under there…it’s better for correcting without having to use an actual colour corrector as well as concealer too! 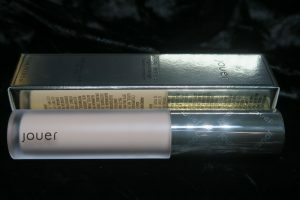 With the Jouer Essential High Coverage Concealer, a little goes a long way and I find building up the coverage you want in fine layers to be the key with this one (as is the case for most full coverage products) to get full but natural looking coverage. It applies well with a brush also, but I prefer using a damp blending sponge for concealer…for such a full coverage concealer it melts in to the skin perfectly, blending out seamlessly and gives immediate great (full) coverage, but without looking or feeling like it! It didn’t crease while I left it a while to see before applying powder, but seeing as I always set my under eye concealer with powder (regardless of concealer formula) I did for a fair test and all and it’s been staying crease free all day! It’s been leaving my under eye looking and feeling fresh and hydrated…no enhancing any fine lines or making the skin look caky and dry which is perfect! I thought the shade Crème might be a bit too dark for the rest of my face, but it’s not…fortunately I don’t tend to get many blemishes as a general rule but at least if I do get a monster one at any point, I know this concealer will stand up to the challenge! Yes it is a pretty big tube for a less than average amount, but needing to use such a tiny bit I feel will make up for this and I really like the formula of this! Apart from that it does tick all boxes for me and I’ll definitely be reaching for it often. Applies well, looks great and wears very well…I was impressed by not only its staying power (as in it actually hanging around all day), but how good it still looks after being on all day too! 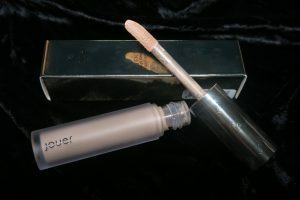 Jouer Cosmetics Essential High Coverage Concealer is available now at Beauty Bay*, Cult Beauty* and Jouer Cosmetics website now!